It’s so easy to let nature influence my art and expression; the more I learn about Earth (and beyond! ), the more it seeps into everything I create. But to be inspired by a theme as unique as galaxy, you don’t always have to go all out with a makeover like the one I created back in my Cosmic Candy video. (Though you’d definitely turn a few heads!) You can simply let the insanely beautiful celestial creations of our universe – from the electric blues and purples of supernovas to the deep hues of the night sky – influence your look. 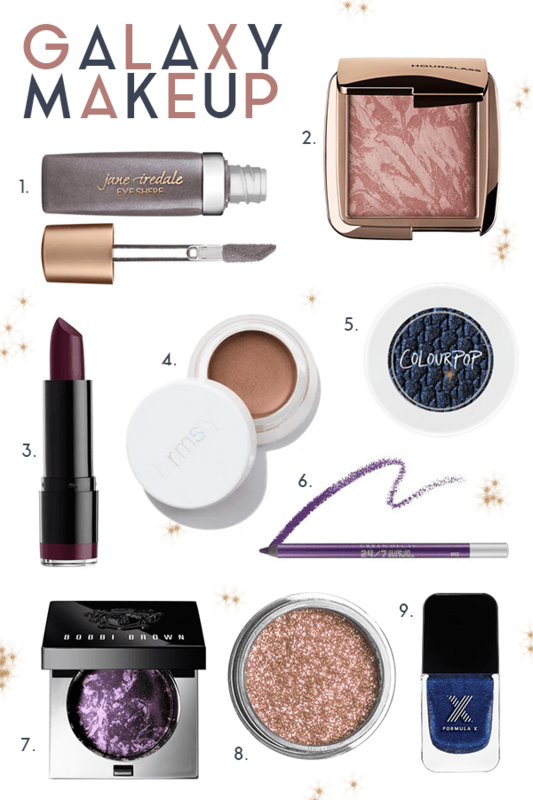 Bobbi Brown’s sequin eyeshadow (the shade above is aptly named Star Beam) inspired this collection – Its purple pigment-flecked powder shimmers with a pearl-infused formula that resembles the night sky. Deep violets and midnight blues come to mind when thinking of galaxies, but the cosmos contain lights that range from dusty pastels to romantic reds and beyond. Add a little sparkle with iridescent nails or a glowing bronzer to hint at the space theme. Or, own your love of all things celestial and rock some glittery lids! Even the marbled tones of many powder blushes and mineral makeup swirl like the Milky Way.